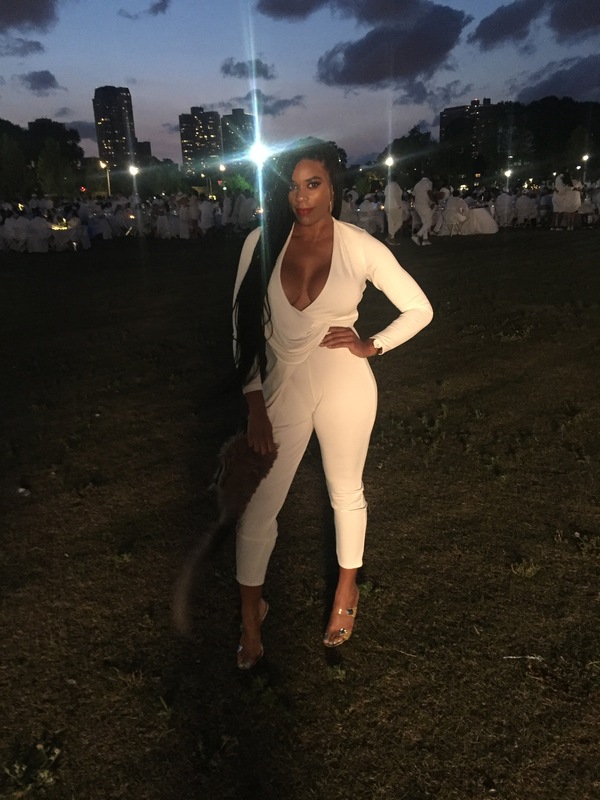 So I finally went to Diner En Blanc Chicago! I had an amazing time. There is a backstory though…Let me back it up to give you guys the full scenario. At this point I REALLY wanted to go because the event was in such high demand. So I started asking around and finally, Ms. Donna knew someone selling the tix. I snatched them up QUICKLY. So, here comes the prep. You MUST wear all white. Your decor MUST be all white. I was in and out of stores shopping for the perfect everything. You also must bring all of your own food, drinks, (Non alcoholic. Alcohol can be purchased from their vendor), decor, table, chairs etc. I’m not going to lie, the prep work IS NOT FUN! I wanted to say forget it numerous times. My date and I ordered Italian from Rosebud in Little Italy and dessert came right from Mariano’s. Once I got there, I realized how minimal my decor was compared to other tables! People went ALL OUT. I was impressed. Then I felt silly because I hadn’t done a lot. *shrug*. Plus, it was FREEZING in Chicago. Middle of August and it was legit like a chilly fall night! However, people still came and stayed…and had a great time. I was one of them. I’m so lucky I chose a date that made the best out of the night. At one point in time, I looked at him, shivering and said, “I’m SO cold. I can’t feel anything.” He just smiled and said, “We’re gonna act like were on a beach!! It’ll be fine!” LOL I laughed and said, “Okkkkkk”. We quickly ate our food and began to drink and dance the night away. I LOVED the band. They made me feel like I was in New Orleans. The DJ was NICE . Female DJ too! **STAND UP LADIES!!! 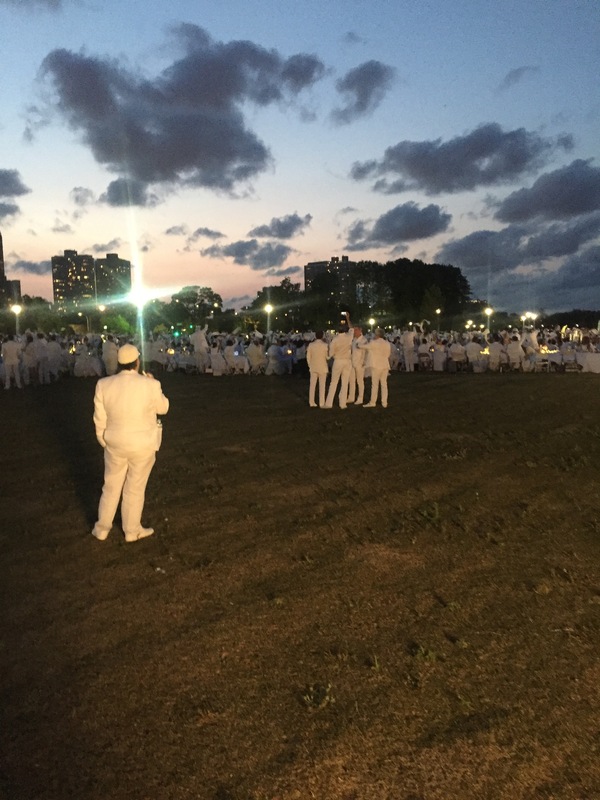 ** We literally shut Diner En Blanc Down! We just didn’t stop dancing. Overall, the night was magical. 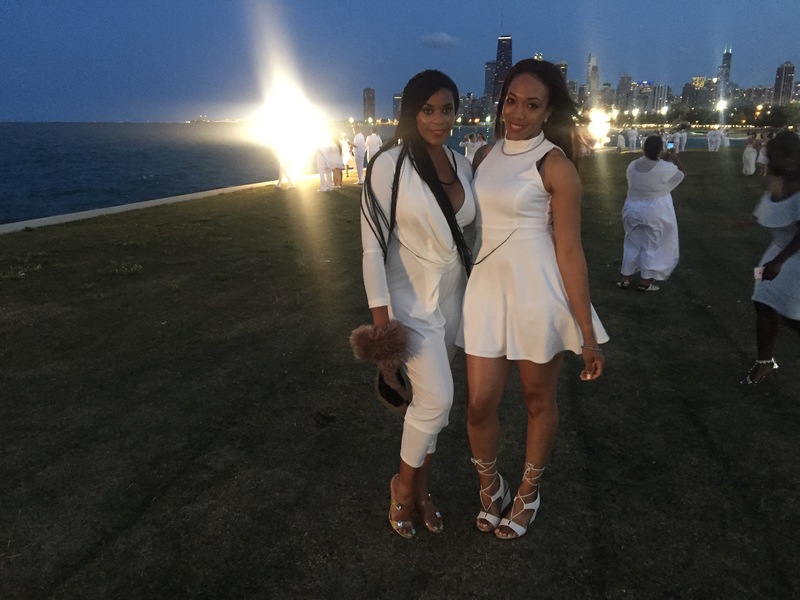 All of the Chicagoans in all white…seeing the backdrop of the city while the sun was setting. The diversity was everywhere. Black, white, young, old, gay, straight…I LOVED IT. It made me fall in love with Chicago all over again. I will definitely do Diner En Blanc again. This time, I will be more prepared and I’m sure it’ll be less stressful. Did you go to Diner En Blanc?? Post your experience in the comment section! !